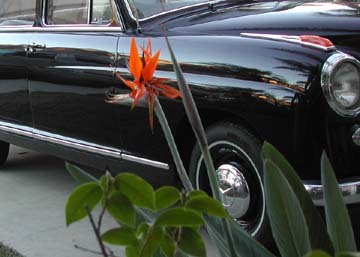 Our 1959 Mercedes-Benz Type 219 Ponton sedan is a daily driver. 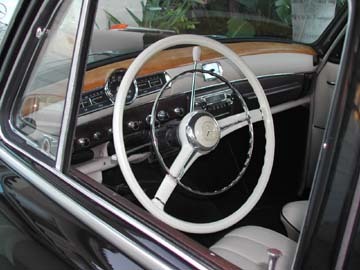 The car was restored during 1997-1998 and has been driven regularly since then. We find it comfortable and fun to drive. 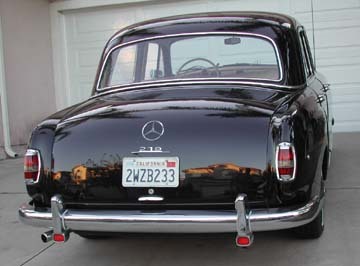 The 6-cylinder, dual carburetor engine is powerful enough to flow with modern traffic on California's freeways. Someone either changed the engine, or installed the dual carburetors and manifold on the old engine. It would be interesting to find out which, maybe by engine number? Several times a year we take the car on longer trips, such as to Monterey Bay or the Sierra Nevada mountains. Its only known problems are persistent oil leaks from all major components that hold oil.....soon to be repaired. We live in Southern California, approximately one hour south of Los Angeles. 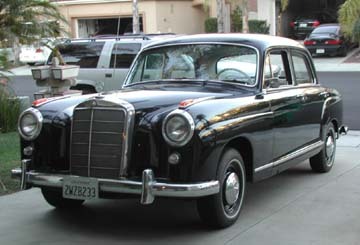 The W105 219 Ponton sedan originally came with a single carburetor "M 180.921" engine. Reference the Vehicle ID Plate Location page for location of data plates.